Andrea Bocelli will releases his highly anticipated new 16-track album ‘Si’ last October – his first brand new material in 14 years – billed as “a celebration of love, family, faith and hope”. ‘Si’ will feature tracks co-written with Ed Sheeran and Tiziano Ferro as well as duets with Dua Lipa, fellow contemporary classical star Josh Groban and soprano Aida Garifullina. The album also sees Bocelli’s 20-year old son Matteo collaborate with him on the track ‘Fall On Me’ which appears on the soundtrack to the Disney movie The Nutcracker and The Four Realms. Bocelli has performed for four US Presidents, two Popes and many Royal families across the world, as well as at high-profile ceremonies for the Olympic Games and the World Cup. The Maestro has countless music awards to his name over past 25 years in music and even boasts a Star on the Hollywood Walk of Fame, which he received in 2010 for his contribution to live theatre. 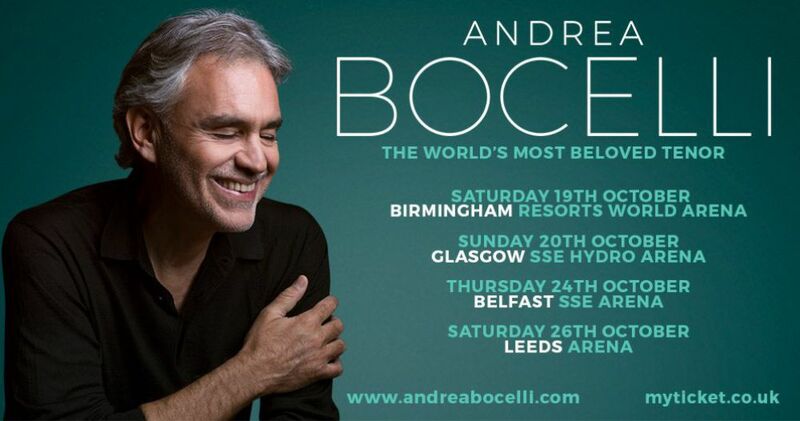 ANDREA BOCELLI VIP TICKET EXPERIENCES!